A competency-based assessment is an assessment that does not lay emphasis on numerical scores. For a Competency-based assessment, an instructor marks a learner as either "Competent" or "Not Competent" after learner makes a submission. The labels could be different depending your requirements. There could be more than two labels as well, for example "Moderately Competent" ,"Non Competent" and "Competent". For a particular classroom, a learner would be considered as "Competent" if he/she manages to obtain a "Competent" label in all the competency-based assessments from the instructor in that classroom. Usually, in real-life scenarios, the learner will keep on taking assessments repeatedly, until he/she manages to obtain a "Competent" label for all assessments. 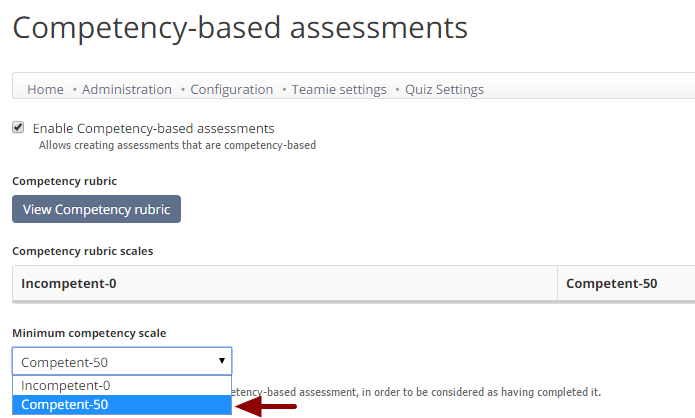 Note: If competency-based feature is enabled, you can not attach rubric to an offline assessment and it is not currently supported. Is it possible to edit the default competency scales? 2. 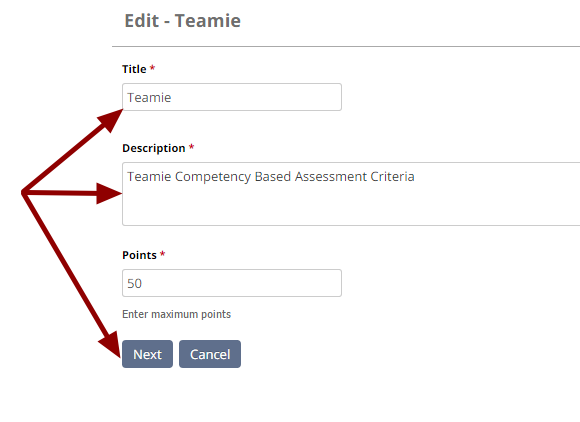 Select Competency Based Assessment from Manage Teamie Section. 3. By default competency-based assessment feature is not enabled. 4. Tick the Enable Competency-based assessments checkbox. 5. Scroll down the page and click Save configuration to save the changes. Once changes are saved, competency-based feature will be enabled. 6. A message appears confirming that changes have been saved. 3. Click View Competency rubric. 4. Clicking View Competency rubric opens up a popup, which shows the rubric title, associated criteria and its scales, along with total points. The minimum competency rubric scale that a learner must get in a competency-based assessment, in order to be considered as competent. 3. You would be able to see the list of scales created for the rubric, out of which you can select and make any of the scale that learners must get to be competent in all the assessments in a classroom. 4. Scroll down the page and click Save configuration to save the changes. Competency labels are editable. You have privilege to edit the competency labels anytime. The moment you make changes in competency labels, it gets reflected in all classrooms. 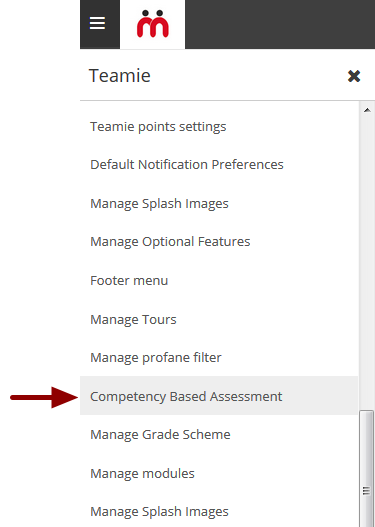 Basically there are four competency labels which can be defined by administrator user or by the user who are having permission to access Competency Based Assessment feature. Below is the list of labels and you can edit these labels as per your requirement anytime. 3. 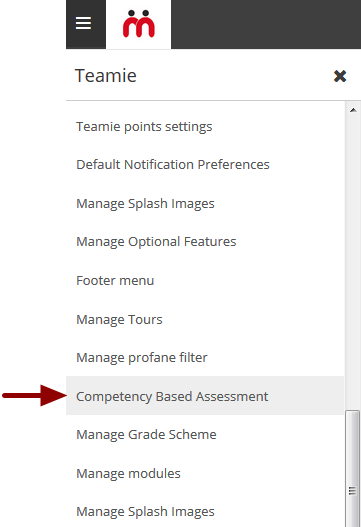 In the below screen, "Competent" is the default label set by administrator user that will displayed in the Competency Report once a learner completes all competency-based assessments. If you wish to change this label from "Competent" to some other label (for example: "Qualified") then you can do it, just type out the new label in the text box and save it. 4. Similarly you can also edit the label text for Incomplete label, type out the new label in the text box. 5. Edit the label text for Label for No submission has made. This label text would be appearing when learner did not make any submission for assessments. 6. Edit the label text for Label for label for Submission has made but not yet graded. This label text would be appearing when learner has made the submission but instructor not yet graded the learner's submission. 7. Click Save Configuration to save the changes made for the competency labels. Yes. 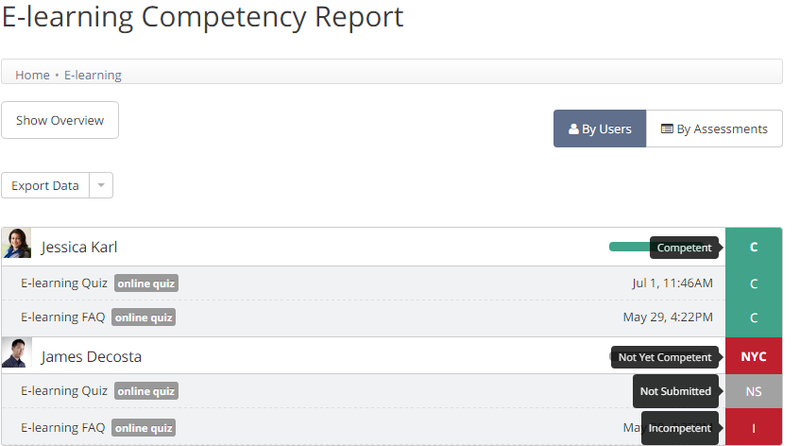 You can edit the Competency-based rubric title, criteria and its scales any time. 4. If you wish to rename the rubric title then click Edit, change the rubric tile and save it. 5. 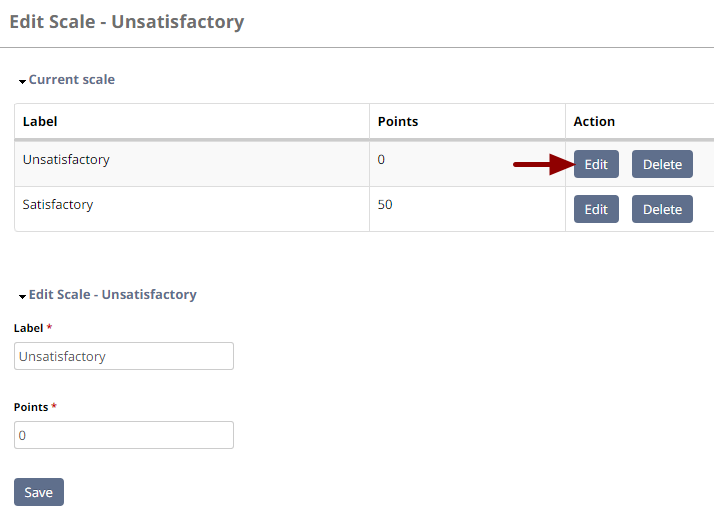 Click Edit to update criteria's details like changing criteria title and its scales. 6. Edit the fields (like Criteria Title, Description and Points) and click Next to save the changes. 7. A message confirms that criteria title successfully updated. 8. 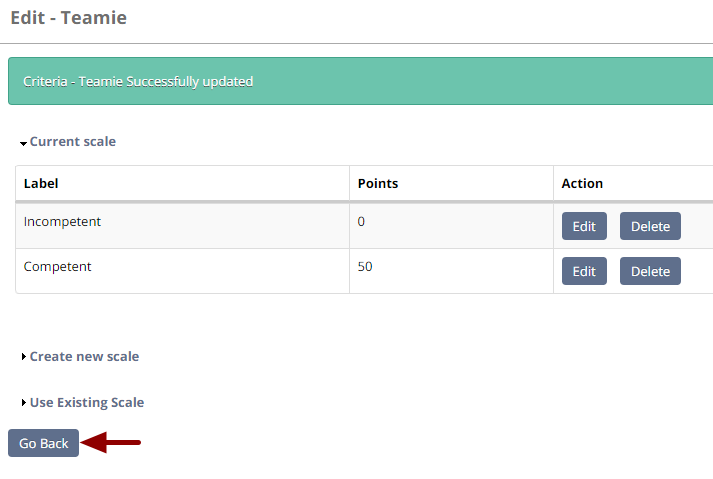 You can also edit the criteria scales. To edit a scale, click Edit for the corresponding scale. 9. 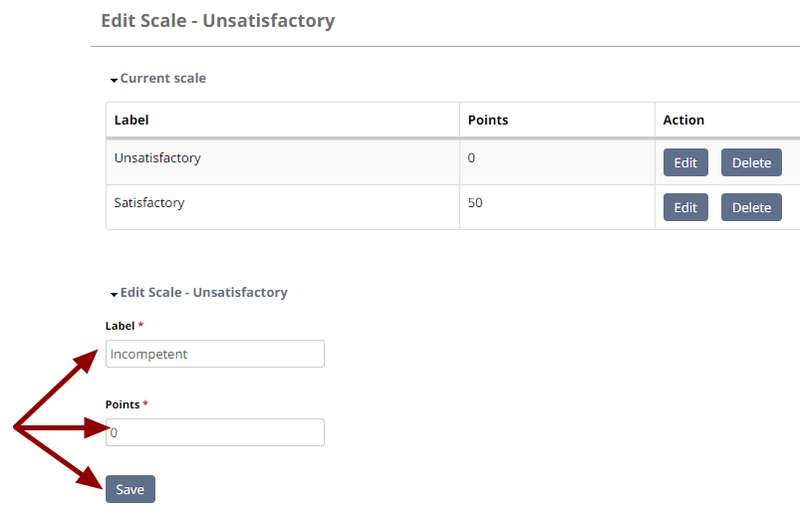 Update the scale details (like changing the scale title & updating the scale points). Once you are done with updating scale details as mentioned above then click Next to save the changes. 10. A message confirms that criteria successfully updated. Click Go back to go to the rubric page where you would see all the changes made in the rubric and its scales. 11. You will notice that criteria scales have been updated.